Check out my NY Times student interactive for English Language Learners on Martin Luther King, Jr. Students learn about idioms and respond to a writing prompt. Martin Luther King’s birthday will soon be celebrated across the United States, and I thought a “The Best…” list on him would be timely and useful. You might also be interested in The Best Resources To Remember Dr. Martin Luther King’s Death (& Life). I’ve only included sites that I thought would be accessible to English Language Learners. Unfortunately, most of these sites just provide a very “safe” picture of the man as a nonviolent Civil Rights leader — without much about his work challenging economic injustice and the Vietnam War. 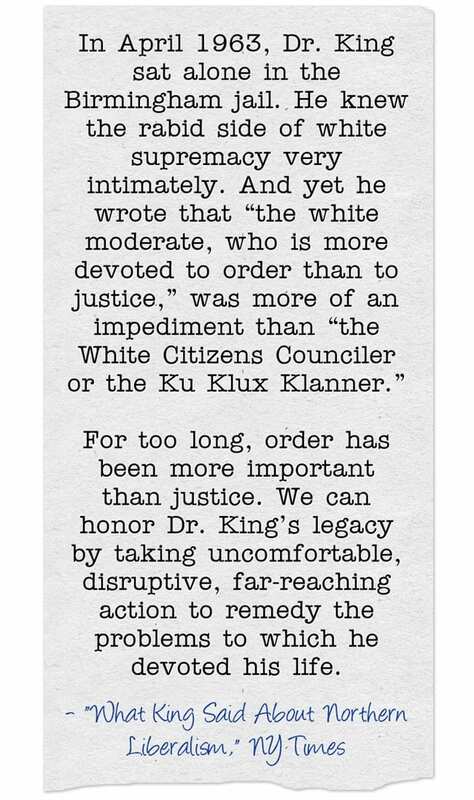 I would strongly encourage any teacher to include, in any lessons related to King, either an excerpt from or a lesson related to Julian Bond’s essay on the making of King into a non-threatening hero. You might also be interested in The Best Sites For Learning About The Martin Luther King Memorial. * The audio, and text, of his I Have A Dream Speech, hosted by American Rhetoric. Here’s another site that has a similar presentation. * Another excellent listening exercise, time using a short biography of King. * A short King biography, time from the Library of Congress. * The Seattle Times has an exceptional special report on King. * There’s a good CNN Special Report on King. * A Many short videos of King from the Biography Channel. * Scholastic has information and a slideshow at The Legacy Of A Leader. * Time Magazine has a slideshow on King’s life. * EL Civics has a online lesson on King. * The Associated Press has a number of multimedia resources on King. * Enchanted Learning has some very simple resources on King. * Here’s an online lesson for English Language Learners about King from Famous People Lessons. Its sister site has a lesson on Martin Luther King Day. * The King Center has many resources, though few are ELL accessible. * The New York Times has another slideshow. * Here’s a slideshow on King’s life that provides audio support for the text. It was created by Jen Farr. * The Assassination of MLK Jr. The New York Times Learning Network has a collection of lesson plans that could be modified for ELL’s,as does Thinkfinity. Do’s and Don’ts of Celebrating MLK Day is another good guide from Teaching Tolerance. While a college student in 1947, Martin Luther King also wrote a column in the campus newspaper and titled it “The Purpose of Education.” You can read the complete piece at Stanford’s collection of his papers), and it might be a useful article for the classroom. The History Channel has several videos on Dr. King. How Stuff Works has some videos, too. ESOL Courses has an impressive collection of Online Exercises and Printable Worksheets related to King. Remembering Martin Luther King Jr. is a series of photos from The Los Angeles Times. MLK Honored with Memorial on the Mall is a video report from CBS News. King holiday observed across the U.S. is a series of photos from The Sacramento Bee. tes, a British-based site for teachers, has some good lesson resources on King. Here is a Martin Luther King, Jr. Internet scavenger hunt. Thanks to Michelle Henry for the tip. A new online project has “digitize” 200,000 items related to King and has now gone “live.” You can visit the site here, and read about it here. L.A. Times’ images of Martin Luther King Jr. is a photo gallery from…The LA Times. Day of service honors Martin Luther King Jr. is from CNN. Six Leadership Communication Lessons from Martin Luther King, Jr.
MLK Jr.: His life, his monument and why we celebrate him is an infographic from the Orange County Register. What Has Each Of Us Done Lately To Bend The “Arc Of The Moral Universe”? English Central has a nice collection of King videos. MLK Was a Revolutionary, Not Just a Dreamer is from The Root. Dr. Martin Luther King Jr.- Assassination and Legacy is from a radio program originating from the Canadian Broadcasting Corporation. It’s an hour-long piece on him, but what really stands out is a short recorded conversation broadcasters had with him in his hotel room right before his assassination. King provides what I believe is the best explanation of civil disobedience I have ever heard, and I speak from a fair amount of experience with it when I spent seven years with the Catholic Worker Movement long ago. You have to register — for free — in order to listen to the program, but it’s well worth it if you are ever going to teach about civil disobedience. The greatest MLK speeches you never heard is from CNN. Freedom’s Ring is an amazing multimedia presentation of King’s “I Have A Dream” speech (thanks to Eric Roth for the tip). The Zinn Education Project has a great collection. The Guardian has a nice interactive on King’s I Have A Dream speech. 10 ways to be like Martin Luther King after Ferguson is from MSNBC. King’s Last March is from American RadioWorks. What Martin Luther King Jr. Was Like as a Child is from TIME. Four Resources for Exploring Media Literacy Through the Legacy of Dr. Martin Luther King Jr. is from KQED. The History Channel has a decent curriculum guide. Group Invokes Martin Luther King Jr To Push Anti-Immigrant Message is from Think Progress. An Unsettled Chapter in Martin Luther King’s Legacy is from The New York Times. The National Writing Project has a number of related resources. Five myths about Martin Luther King is from The Washington Post. Read Write Think has some useful lesson ideas. Martin Luther King, Teachers’ Unions and Social Justice is by Yohuru Williams. 5 Minute English has a simple lesson. ESOL Courses has some ELL-accessible resources. Digital Tools to Inspire Your Students on Martin Luther King, Jr. Day is from Facing History. 6 ways to meaningfully honor Martin Luther King Jr. Day is from Mashable. Celebrating Martin Luther King Day is from The New York Times Learning Network (it’s different from another resource page they have previously published). Race, Civil Rights and Photography is from The New York Times. Martin Luther King probably would have hated what his day has come to represent is from Quartz. What Would Martin Say? is by Yohuru Williams. Read the letter the FBI sent MLK to try to convince him to kill himself is from Vox. 3 parts you don’t remember from Martin Luther King’s “I Have a Dream” speech is also from Vox. A Picture of Dr. King as a Child is by Doug Lemov. When Martin Luther King was accused of inciting violence is from Vox. 11 forgotten Martin Luther King quotes that show he was a revolutionary is also from Vox. 5 facts about race in America is from Pew Research. The Unmet Dreams of Martin Luther King, Jr. and the Civil Rights Movement (includes Lesson Plan) is from KQED. Martin Luther King, Jr.: 50 Years Worth of Lessons From a Giant is from Facing History. Going the Extra Mile for MLK Day is from Teaching Tolerance. Multiple related teaching resources from the PBS News Hour. The Life and Words of Dr. Martin Luther King Jr. is a well-done interactive. PBS has a lesson on King that isn’t really that great, but teachers might want to take pieces and modify them. Don’t Forget That Martin Luther King Jr. Was Once Denounced as an Extremist is from TIME. Martin Luther King Jr. Changed a Nation in Only 13 Years: A timeline is from The Atlantic. The Whitewashing — and Resurrection — of Dr. King’s Legacy is from TIME Magazine. What King Said About Northern Liberalism is from The NY Times. The Consequences of Martin Luther King Jr.’s Canonization is from The Atlantic. MLK: MOUNTAINTOP MOMENTS is from The History Channel. You might also find my 900 other “The Best…” lists useful. Wow Larry. That’s over the top! I always use the “I have a dream ” speech on karaoke and let the students try to do it themselves with a mic and keep up to MLK Jr. Not easy — he goes fast, then slow, then fast…. Thanks for the mention! Honored once again! That’s one heckuva list of useful resources. Thank you Larry! This year, for the first time, I’m having university writing students read “Letter from a Birmingham Jail”, and write a reaction paper. I’m curious about their responses. Will the details seem too distant? Will the metaphors appear too Christian? Will the essay seem too idealistic and too demanding of sacrifice? Although the letter seems like an eloquent piece of global literary masterpiece to me, I do worry it will appear far too American for my international ESL students. By the way, here’s an insightful analysis of Dr. King’s “I Have a Dream” speech for advanced English, speech, or communication students.